Surface and groundwater supplies in some regions are already stressed by increasing demand as well as declining runoff and groundwater recharge. In some regions, particularly the southern U.S. and the Caribbean and Pacific islands, climate change is increasing the likelihood of water shortages and competition for water. Water quality is diminishing in many areas, particularly due to increasing sediment and contaminant concentrations after heavy downpours. Annual precipitation and river-flow increases are observed now in the Midwest and the Northeast regions. Very heavy precipitation events have increased nationally and are projected to increase in all regions. The length of dry spells is projected to increase in most areas, especially the southern and northwestern portions of the contiguous United States. Short-term (seasonal or shorter) droughts are expected to intensify in most U.S. regions. Longer-term droughts are expected to intensify in large areas of the Southwest, southern Great Plains, and Southeast. Key Message: Increased Risk of Flooding in Many Parts of the U.S. Flooding may intensify in many U.S. regions, even in areas where total precipitation is projected to decline. Climate change is expected to affect water demand, groundwater withdrawals, and aquifer recharge, reducing groundwater availability in some areas. Sea level rise, storms and storm surges, and changes in surface and groundwater use patterns are expected to compromise the sustainability of coastal freshwater aquifers and wetlands. Increasing air and water temperatures, more intense precipitation and runoff, and intensifying droughts can decrease river and lake water quality in many ways, including increases in sediment, nitrogen, and other pollutant loads. Climate change affects water demand and the ways water is used within and across regions and economic sectors. The Southwest, Great Plains, and Southeast are particularly vulnerable to changes in water supply and demand. Changes in precipitation and runoff, combined with changes in consumption and withdrawal, have reduced surface and groundwater supplies in many areas. These trends are expected to continue, increasing the likelihood of water shortages for many uses. Increasing flooding risk affects human safety and health, property, infrastructure, economies, and ecology in many basins across the U.S.
Increasing resilience and enhancing adaptive capacity provide opportunities to strengthen water resources management and plan for climate change impacts. Many institutional, scientific, economic, and political barriers present challenges to implementing adaptive strategies. Total freshwater withdrawals (including water withdrawn and consumed as well as water that returns to the original source) and consumptive uses have leveled off nationally since 1980 at 350 billion gallons of withdrawn water and 100 billion gallons of consumptive water per day, despite the addition of 68 million people from 1980 to 2005.4 Irrigation and electric power plant cooling withdrawals account for approximately 77% of total withdrawals, municipal and industrial for 20%, and livestock and aquaculture for 3%. Most thermoelectric withdrawals are returned back to rivers after their use for power plant cooling, while most irrigation withdrawals are consumed by the processes of evapotranspiration (evaporation and loss of moisture from leaves) and plant growth. Thus, consumptive water use is dominated by irrigation (81%) followed distantly by municipal and industrial (8%) and the remaining water uses (5%). The largest withdrawals occur in the drier western states for crop irrigation. In the east, water withdrawals mainly serve municipal, industrial, and thermoelectric uses. Some of the largest demand increases are projected in regions where groundwater aquifers are the main water supply source, such as the Great Plains and parts of the Southwest and Southeast. The projected water demand increases (shown below) combined with potentially declining recharge rates threaten the sustainability of many aquifers. Climate change is projected to reduce water supplies in some parts of the country. This is true in areas where precipitation is projected to decline, and even in some areas where precipitation is expected to increase. Compared to 10% of counties today, by 2050, 32% of counties will be at high or extreme risk of water shortages. Numbers of counties are in parentheses in key. Projections assume continued increases in greenhouse gas emissions through 2050 and a slow decline thereafter (A1B scenario). (Figure source: Reprinted with permission from Roy et al. 2012.5 Copyright American Chemical Society). 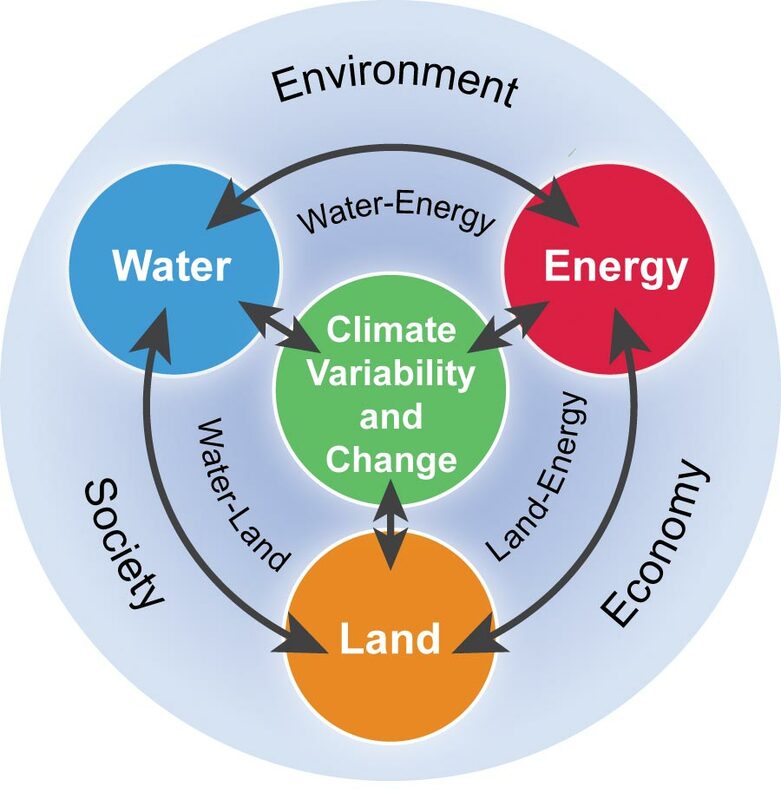 Energy, water, and land systems interact in many ways. Climate change affects the individual sectors and their interactions; the combination of these factors affects climate change vulnerability as well as adaptation and mitigation options for different regions of the country. The dependence of energy systems on land and water supplies will influence the development of these systems and options for reducing greenhouse gas emissions, as well as their climate change vulnerability. Jointly considering risks, vulnerabilities, and opportunities associated with energy, water, and land use is challenging, but can improve the identification and evaluation of options for reducing climate change impacts. Energy production, land use, and water resources are linked in complex ways. Electric utilities and energy companies compete with farmers and ranchers for water rights in some parts of the country. Land-use planners need to consider the interactive impacts of strained water supplies on cities, agriculture, and ecological needs. 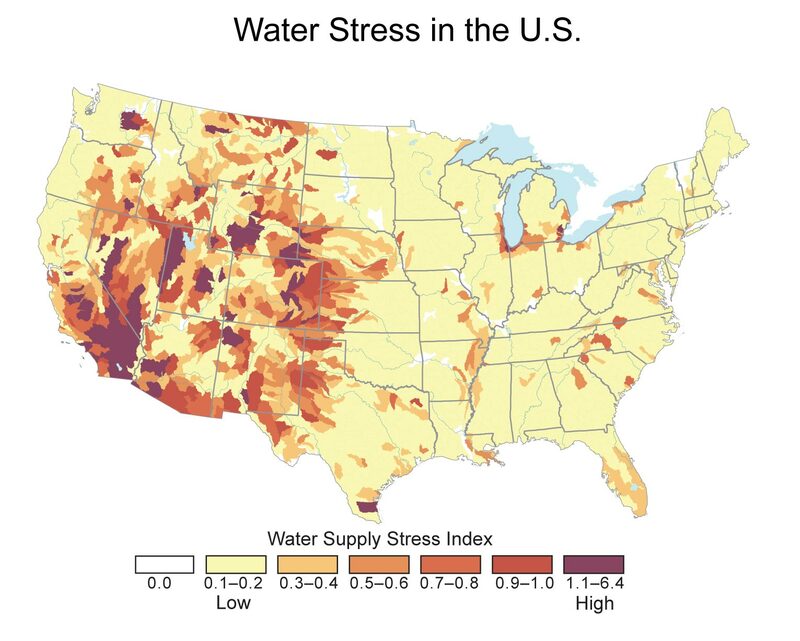 Across the country, these intertwined sectors will witness increased stresses due to climate changes that are projected to reduce water quality and/or quantity in many regions and change heating and cooling electricity demand, among other impacts.